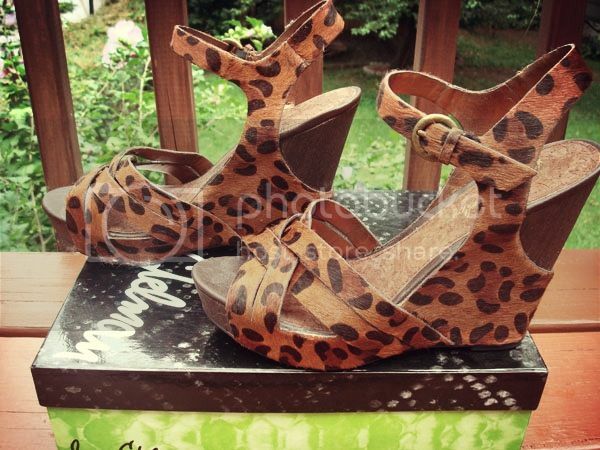 Every wardrobe deserves a fab pair or two of leopard print shoes. And although I love these, sadly there's no more room in my closet for them, thus they need a new home that will continue to put them to use fabulously. Worn once, the 5 inch wedge with 1 inch platform is beyond comfortable. They're genuine leather with real fur, and barely show any signs of wear. Although a size 9M, they fit more like an 8 1/2. I'm letting these go for $15!! Original box included.